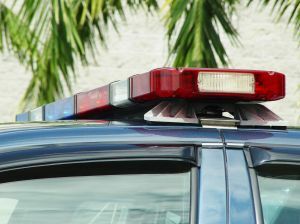 On July 26, 31-year-old Thomas Ripp was placed on emergency suspension from the New Orleans Police Department after crashing his unmarked police car while allegedly intoxicated in Lake Vista, according to several news reports. Ripp was assigned to the Homicide Division, and has been with the department for eight years. He was off-duty when he crashed into a cement light pole after striking a curb at approximately 5:40 a.m. on Sunday, according to police. Although results of a blood test conducted on Ripp were not revealed, NOPD spokesman Tyler Gamble said that Ripp did test over the legal limit for alcohol. He was treated for minor injuries which were not disclosed at a local hospital before being advised of his rights and arrested. No one was in the vehicle with Ripp when the accident occurred. The police department’s Public Integrity Bureau placed Ripp on emergency suspension immediately after his arrest; the bureau will further investigate the incident. In Louisiana a first DWI (driving while intoxicated) offense will leave those convicted facing fines of up to $1,000, a maximum of six months in jail with 48 hours minimum jail time (which may be suspended, depending on BAC), probation, community service, and more. Driving while under the influence is a serious crime in every state, although penalties vary. Those who are found guilty of DUI in Michigan will face possible jail time, fines, community service, driver’s license suspension, a criminal record, and other punishment. Long gone are the days when an individual arrested for drunken driving simply paid a fine and received a slap on the wrist. This is a criminal offense that requires that legal guidance and support of a skilled defense attorney. If you have been charged with driving while intoxicated, consult with an experienced Michigan DUI defense lawyer immediately in order to obtain the best possible outcome and limit the potential damage to your reputation, career, and future.